Overview: “In brightest day, in blackest night, no evil shall escape my sight. Let those who worship evil’s might, beware my power, Green Lantern’s light.” With that oath, test pilot Hal Jordan is given a power ring from a dying alien and joins the intergalactic police force known as the Green Lantern Corps. 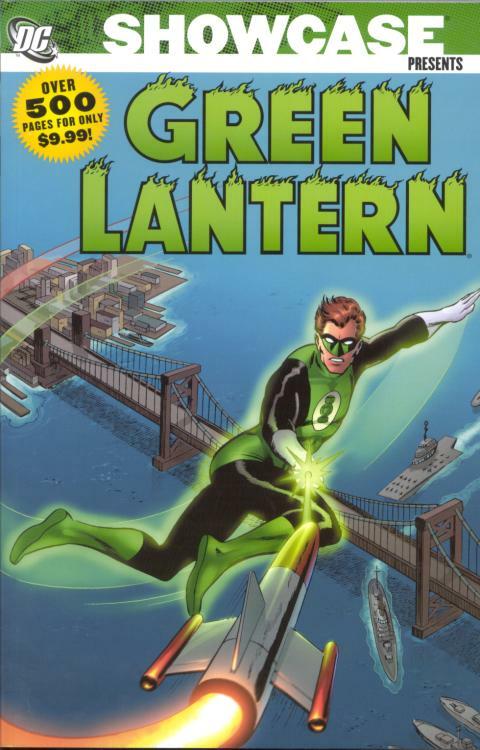 Green Lantern debuted in Showcase, which was DC’s “try-out” book for new characters before giving them their own book. Green Lantern quickly moved into his own title, as well as becoming a founding member of the Justice League of America. This volume collects the early adventures, introducing us to the Guardians and their Green Lantern Corps; Hal’s girlfriend (and boss) Carol Ferris; and numerous villains, such as the Qwardians, Hector Hammond, and Sinestro. Why should these stories be Showcased? : I am torn on this volume. As a legacy character, I do believe that these stories should be collected and available in multiple formats. But when your feature character has a color in his/her name, such as Green Lantern, and his one weakness is anything colored yellow, reading the stories in black & white lessens the impact of the stories. Also, the best Green Lantern stories come much later. Footnotes: Showcase Presents Green Lantern Vol. 1 was the first Showcase volume published by DC Comics in 2005. This edition and the next three released Showcase volumes were priced at $9.99. All other Showcases have been priced at $14.99 or higher. If you like this volume, try: Green Lantern: Rebirth, which collects the six issue mini-series from 2004 by Geoff Johns and Ethan Van Sciver. This story arc brought Hal Jordan back into the mainstream DC Universe as the Green Lantern from Sector 2814. This story started Johns eight-year run with Hal Jordan and the Green Lantern Corps. This entry was posted in DC Showcase Presents, Green Lantern and tagged Gil Kane, Green Lantern, John Broome. Bookmark the permalink. Pingback: Throwback Thursday – Showcase Presents Green Lantern Vol. 1 | Worst. Comic. Podcast. EVER!